Shealoe Butter (Butyrospermum Parkii Aloe Barbadensis) - Sweetgrass&Rain Inc. The cooling feeling of Aloe and the creamy texture of Shea Butter come together to form a very unique product. 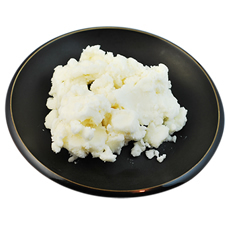 Shealoe is created using equivalent quantities of Shea Butter and Aloe Vera Gel. Shealoe may be used "as is" to provide all the advantages of Shea Butter, plus the moisturizing and soothing properties associated with Aloe Gel to soothe dry and irritated skin. Shealoe is ideal in many formulations and provides a non-greasy moist feel upon application.